Many sports require athletes to execute powerful movements – those that require strength and speed. Speed-strength performance can be defined as the execution of a movement that requires the development of large forces and high movement speeds. Obviously, strength training has a positive impact on strength and speed. Recently, a study in the Journal of Strength and Conditioning Research took a look at two exercises – the back squat and leg press – and compared their relative effects on sprint and jump performance. 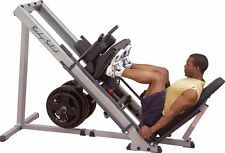 “Compared with the squat,… the hip extensors are not trained within the extension range” of the leg press exercise. In this study, the authors found that the back squat exercise improved sprint and jump performance more effectively than the leg press, because of the better transfer effects. At Athletic Performance Training Center, we like to incorporate single-leg exercises to complement bilateral exercises like the squat. Exercises like the step-up, Bulgarian (rear leg elevated) split squat, and single-leg squat are routinely integrated into our athletes’ training. Research tells us that the (back) squat is well-established to improve strength and power; as well as sprinting, jumping, and change-of-direction performance. But movements like sprinting, jumping, and changing direction are performed either unilaterally, or with weight transferred to one leg at a time. Therefore, it would be logical to expect that some aspects of athletic performance could be improved with unilateral exercises, which offer more specificity and may be more similar to athletic movements. Unilateral exercises can also improve balance and stability, decrease lateral strength disparities, and maximize transfer between training and competitive performance. In the study, the unilateral group squatted exclusively with the Bulgarian split squat, whereas the bilateral group trained only with the back squat.